The Italian novelist Elena Ferrante has become one of the biggest literary sensations of recent years, best known for her four-part Neapolitan Novels cycle (My Brilliant Friend, The Story Of A New Name, Those Who Leave And Those Who Stay, and The Story Of The Lost Child), international bestsellers that are easy to spot on American shelves on account of their terrible (or, per The Atlantic, brilliantly terrible) covers. At the same time, Ferrante is a mystery. The name is a pseudonym, and speculations on her true identity have become a lit-world parlor game, as tantalizing an enigma as Donald Trump’s tax return. As it just so happens, some answers to both of these mysteries dropped back-to-back this weekend in Manhattan. Hours after The New York Times published its story about the nearly billion-dollar loss in Trump’s 1995 tax return, based on documents sent to them by an unknown source, The New York Review Of Books posted a credible solution to Ferrante’s identity, based on another set of leaked financial papers. 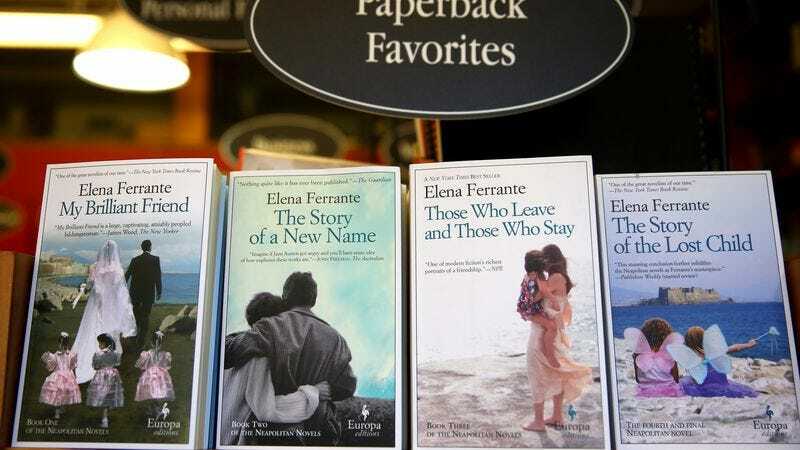 Like many—maybe most—enthusiastic Ferrante readers, I have no interest in knowing who the writer who publishes her novels under the name Elena Ferrante is. I don’t care. Actually, I do care: I care about not finding out. But at the same time, Claudio Gatti’s “Elena Ferrante: An Answer?” has managed to raise more questions. Gatti, who received the payment and revenue records of Ferrante’s Italian publisher from an anonymous source, makes a pretty strong case that the novelist is actually Anita Raja, an obscure translator of German literature. Raja is married to the well-regarded writer Domenico Starnone, who was at one point himself suspected of being Ferrante, and much of Gatti’s case is based on compensation (Raja receives the publisher’s largest payments) and real estate transactions. Though Raja’s name has been mentioned in passing before, all the previous serious attempts to figure out Ferrante’s identity have been literary in nature, based on the author’s familiarity with literature and politics and her knowledge of the area around Naples in the mid-20th century. If correct, Gatti’s “follow the money” approach has unearthed some familiar literary questions about authorship. For one, it offers the possibility that many details in Ferrante’s work that have been widely been assumed to be autobiographical might not be. Or, as Gatti writes in an accompanying blog post that delves needlessly into Raja’s family, “There are no traces of Anita Raja’s personal history in Elena Ferrante’s fiction.” Though born in Naples, Raja was raised from early childhood in Rome, meaning that Ferrante’s celebrated depictions of the city in the 1950s, ’60s, and ’70s—if in fact written by Raja—are not firsthand. But to that end: How much did it matter when everyone assumed that they were? Elena Greco, the narrator of the Neapolitan Novels, has always been assumed to be a stand-in for Elena Ferrante, or the whoever the real Elena Ferrante might be. Given Ferrante’s affection for postmodernist tricksters like Italo Calvino, doesn’t it seem fitting if both Elenas are just characters: a semi-fictional author persona writing her own alter-ego?